Bedford Academy found the RFU-funded Wasps Academy too strong for them as they were beaten 24-0 under the floodlights at Goldington Road. The game started at a fast pace with both sides wanting to play open rugby. 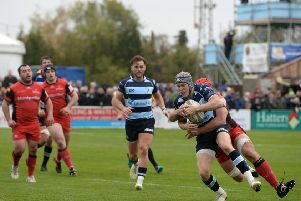 Bedford’s discipline continued to let them down, however, and with two consecutive penalties costing them 60m, Wasps scored their first try when a driving lineout sucked in the Blues defence, allowing the visitors to score on the blind side. Wasps went further ahead just before half-time when another driving lineout gave them their second try to make the half time score 10-0. The visitors extended their lead just after half-time; a driven lineout gained ground, putting the Bedford defence on the back foot, and the Wasps fly-half cut through the Blues defence to score under the posts. The try was converted and Wasps were 17-0 ahead. Bedford began to perform better after this set-back, but could find no way through a solid Wasps defence. Wasps sealed their win with a late try, outflanking the Blues defence wide on the right to win by 24 to nil. Blues Academy director Denis Ormesher said: “Wasps deserved their win. Their lineout gave them a great platform and their defence was strong and well organised. Bedford Blues Academy: Charlie Robinson, Michael Bond, Henry Peck, Charlie Harvey, Callum Strachan, Harry Peterkin, Rahat Choudhury, Mozez Gunda; Olly Howard (c), Ben Phillips; Ross Taylor, Paul Aguele, Jack Gibbs, Tom Fawwsett; Liam Shields. Replacements: George Harris, Ben Thompson, Oliver Pescott-Frost, Leon Patel-Campion, Jacob Moody, Cameron Lawes, Reuben Pritchard, Callum Tormey, Oli Beavis, Max Titchener.